Perforated Swiss stamps first appeared at the beginning of October 1862. These new stamps are referred to by Swiss philatelists as the Perforated Seated Helvetia Issue of 1862-1881. The panes of the Imperforate Seated Helvetia (Strubel) stamps of 1854-1862 were unsuitable for perforating, due to the close proximity of the impressions on the plates, so a new type of stamp had to be designed to facilitate the perforating process. These new stamps are smaller in size than the Strubel issues. The central vignette, featuring the seated figure of Helvetia, holding a spear and a shield, is identical to that of the Strubel issues, but the outside frames are very different. In relation to the complexity of the Strubel Issues of 1854-1862, these new stamps are very simple. Over their 19 year life span, they all had the same perforation gauge, being 11 3/4, and they were only printed on two different types of papers, both utilizing the Cross-in-Oval control mark Type I. The primary attribution factors in classifying these stamps are generally their denominations and their colors. The shades and dates indicated in the listing detail sections are from the Zumstein Spezialkatalog Schweiz 2000 Edition. 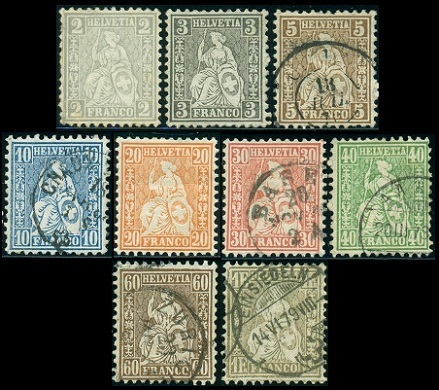 The nine Swiss stamps of the Seated Helvetia design shown above were issued between October 1862 and June 1863, with various printings continuing through 1881. They are all printed on white, wove paper utilizing the Cross-in-Oval control mark Type I. 02 C. (1862 - Zu. #28, Mi. #20, Sc. #41) - Gray, Light Gray, Yellowish Gray. 03 C. (1862 - Zu. #29, Mi. #21, Sc. #42) - Black. 05 C. (1862 - Zu. #30, Mi. #22, Sc. #43) - Brown, Yellowish Brown, Olive Brown, Gray Brown, Lilac Brown, Black Brown. 10 C. (1862 - Zu. #31, Mi. #23, Sc. #44) - Blue, Dark Blue, Greenish Blue, Pale Blue, Light Blue. 20 C. (1863 - Zu. #32, Mi. #24, Sc. #45) - Orange, Yellow Orange, Brownish Orange, Reddish Orange. 30 C. (1862 - Zu. #33, Mi. #25, Sc. #46) - Vermilion, Vermilion Red, Light Vermilion. 40 C. (1863 - Zu. #34, Mi. #26, Sc. #47) - Green, Yellowish Green. 60 C. (1863 - Zu. #35, Mi. #27, Sc. #48) - Bronze. 01 F. (1863 - Zu. #36, Mi. #28, Sc. #50) - Gold, Yellowish Gold. 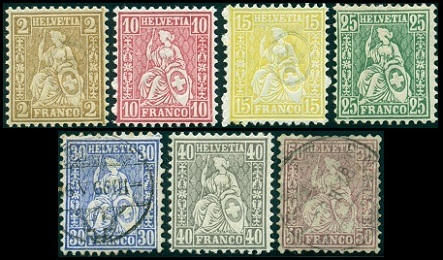 The seven Swiss stamps of the Seated Helvetia design shown above were issued between 1867 and 1878, with printings continuing through 1881. Their physical attributes are the same as those of the 1862-1863 issues, but this new group features new colors and / or denominations. 02 C. (1874 - Zu. #37, Mi. #29, Sc. #52) - Olive, Light Red brown, Light Yellowish Brown, Yellowish Brown Olive, Light Brown Olive, Olive Brown. 10 C. (1867 - Zu. #38, Mi. #30, Sc. #53) - Red, Lilac Rose, Pale Carmine Red, Carmine (Shades), Aniline Rose, Aniline Red. 15 C. (1875 - Zu. #39, Mi. #31, Sc. #54) - Yellow. 25 C. (1868 - Zu. #40, Mi. #32, Sc. #55) - Green, Yellow Green, Blue Green. 30 C. (1867 - Zu. #41, Mi. #33, Sc. #56) - Ultramarine, Blue. 40 C. (1878 - Zu. #42, Mi. #34, Sc. #58) - Gray, Light Gray, Yellowish Gray. 50 C. (1867 - Zu. #43, Mi. #35, Sc. #59) - Lilac, Purple Lilac, Reddish Lilac. 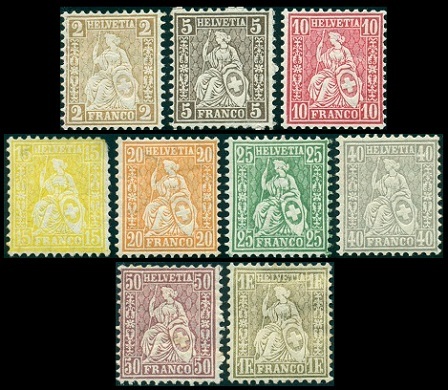 The nine Swiss stamps of the Seated Helvetia design shown above were issued between June 1881 and October 1881. They are all printed on granite paper with blue and red silk fibers, utilizing the Cross-in-Oval control mark Type I. 02 C. (1881 - Zu. #44, Mi. #36, Sc. #60) - Yellowish Olive, Light Olive Brown, pale olive. 05 C. (1881 - Zu. #45, Mi. #37, Sc. #61) - Brown, Gray Brown, Dark Brown, Lilac Brown, Black Brown. 10 C. (1881 - Zu. #46, Mi. #38, Sc. #62) - Aniline Rose, Aniline Red. 15 C. (1881 - Zu. #47, Mi. #39, Sc. #63) - Yellow. 20 C. (1881 - Zu. #48, Mi. #40, Sc. #64) - Orange, Reddish Orange. 25 C. (1881 - Zu. #49, Mi. #41, Sc. #65) - Green, Bluish Green, Yellowish Green. 40 C. (1881 - Zu. #50, Mi. #42, Sc. #66) - Gray (Shades). 50 C. (1881 - Zu. #51, Mi. #43, Sc. #67) - Lilac, Reddish Lilac. 01 F. (1881 - Zu. #52, Mi. #44, Sc. #68) - Gold.